Birth Frederick Neville Thurley was born on 17 September 1883 in Newington, London, EnglandBG. Birth Herbert James Thurley was born on 5 October 1852 in Royston, Hertfordshire, EnglandBG. Marriage Herbert James Thurley and Helen Patty C Warner were married on 26 April 1875 in Holy Trinity Church, Marylebone, LondonBG. Divorce He and Helen Patty C Warner were divorced after 1875 in Marylebone, London, EnglandBG. Birth Laurence Elliott Thurley was born on 17 December 1876 in Newington, London, EnglandBG. Death He died on 14 February 1941 at age 64. Birth He was born on 19 April 1879 at Newington in London, EnglandBG. Death He died on 28 March 1943 at age 63 at 77 Oakleigh Park Drive in Leigh-on-Sea, Essex, EnglandBG. Probate (granted to) His probate was granted to his widow, Florence Amy Louise Thurley on 24 May 1943 in Llandudno, WalesBG. Birth Marion Edith Thurley was born on 9 May 1880 in Newington, London, EnglandBG. Death She died on 13 January 1953 at age 72. Birth Dorothy Helen Thurley was born on 16 February 1888 in Newington, London, EnglandBG. Marriage Charles Blyth and she were married in 1911. Death She died on 17 December 1959 at age 71. Birth Stanley Thomas Herbert Davies was born about 1916. Death He died in 1996. 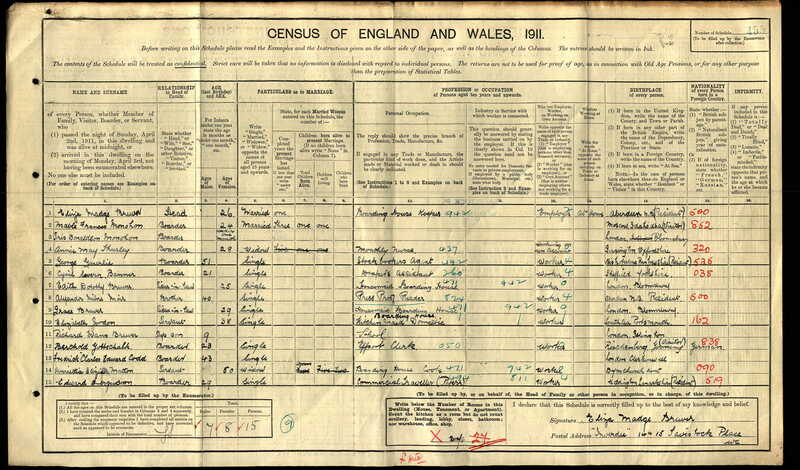 English Census 1851 He appeared as the Head of the Household in the 1851 English Census in St Pancras, London, EnglandBG. Death He died on 4 March 1886 at age ~60. Burial He was buried on 13 March 1886 in Brompton SanctuaryBG. Birth William Lewis Thurley was born on 11 January 1849 in London, Middlesex, EnglandBG. Son He appeared as the son of William Thurley in the 1851 English Census in St Pancras, London, EnglandBG. Marriage William Lewis Thurley and Clara Elizabeth Creswell were married on 5 September 1872 at St. Peters Church in Halworth, St. Saviour, London, EnglandBG. Death He died on 6 July 1879 at age 30. Burial He was buried on 11 July 1879 in Finchley, London, EnglandBG. Daughter Marian Emily Thurley appeared as the daughter of William Thurley in the 1851 English Census in St Pancras, London, EnglandBG. Marriage James Beale and she were married on 11 February 1874 in Clapham Parish ChurchBG. Birth She was born on 22 June 1854. Burial She was buried on 29 April 1897 in Fulham CemetryBG. Birth Florence Thurley was born on 2 September 1859. Death She died on 25 February 1861 at age 1. Birth He was born on 22 March 1862. Death He died on 6 July 1864 at age 2. Birth She was born on 18 May 1864.